Therm-a-Rest Tranquility 4 Wing. Whether you’re looking for a stand-alone open-air canopy for a summer river trip, or you want to add more coverage and ventilation to your Tranquility 4 tent, the Tranquility 4 Wing literally has you covered. This three-point structured tarp system replaces the rainfly of the Tranquility tent for greater ventilation and coverage, or you can set it up with its lightweight aluminum poles to create a comfy open-air shelter, perfect for an afternoon picnic or a protected night spent outdoors. Includes backpack stuff sack for easy transportation. Open-Air Shelter: Structured 3-point tarp system creates a comfortable open-air canopy. Compatible with Tranquility™ 4 Tent: Replaces the rainfly of the Tranquility™ 4 tent to add greater coverage and ventilation. 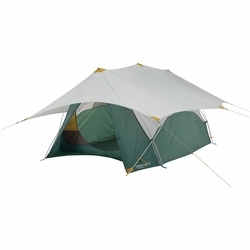 Includes lightweight aluminum poles and guy cords in integrated pockets for easy packing.